Some friends commented that I got bitten by the cooking bug recently which explains my new-found interest in creating new dishes. My family is not complaining and I am just glad that they have been so receptive to my contributions to the dinner table. Today, my brother and his wife returned from their honeymoon and to commemorate the event, I made this yummy dessert with some remaining pomelo in the fridge. This recipe is definitely a keeper in my family. 1. Boil 150ml of water and sugar until sugar dissolves. Leave syrup to cool. 2. Cut mangoes into cubes. 3. Peel pomelo wedges into small pieces. 4. Put sago pearls into a pot of boiling water. Stir and cook until transparent. Pour cooked sago pearls into a sieve. Rinse under running water and drain. 5. 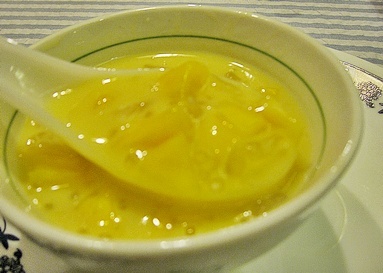 Mix syrup, mango cubes, sago pearls, evaporated and fresh milk in a bowl. Add pomelo and mix well. Serve chilled.